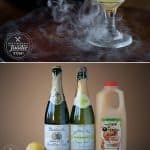 This sweet and sparkling Halloween Witches’ Brew made with fruit juice is a fun party drink for all ages and can easily be made into an adult cocktail too. My foodie-in-training kids went to an extraordinary preschool. One of the best parts about the school was how they taught the kids how important community is, and one of the methods in sharing that lesson is by having the class eat together. From age 2 all the way through early elementary school, the kids wouldn’t bring in their own snack (we called it mini meal) or lunch. The parents brought in the ingredients and then the parent helpers with the children would prepare the food and everyone would sit together and eat. This methodology stressed the importance of making healthy eating choices (probably one of the many reasons my kids love things like green smoothies and beet soup) as well as the significance of being able to sit around the table and maintain a social conversation (even with a toddler). Every Halloween in the older kids’ classes, they would make Witches’ Brew. 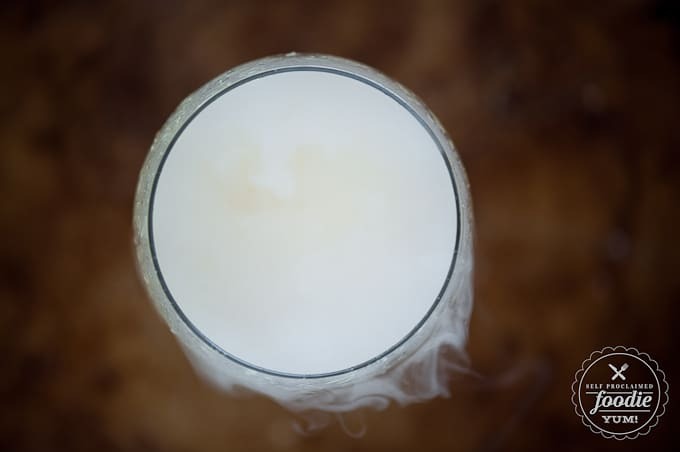 The trick to any witches’ brew is the dry ice. You have to go for the full effect. Its even more dramatic when you make it in a punch bowl or a pitcher. Just be sure to not fill it all the way with the liquid because the dry ice will make it bubble over (I speak from experience). Now, witches’ brew can really be made of whatever you want, but I found this combination to be best. The orange juice combined with the apple and white grape juices produces a cool orangy-yellow color – perfect for Halloween. It is a very sweet and flavorful drink – it is 100% fruit juice afterall. If its too sweet for you, just dilute it by as much as half with club soda. That will make it even more refreshing. Want to make it boozey for the adults? Easy. 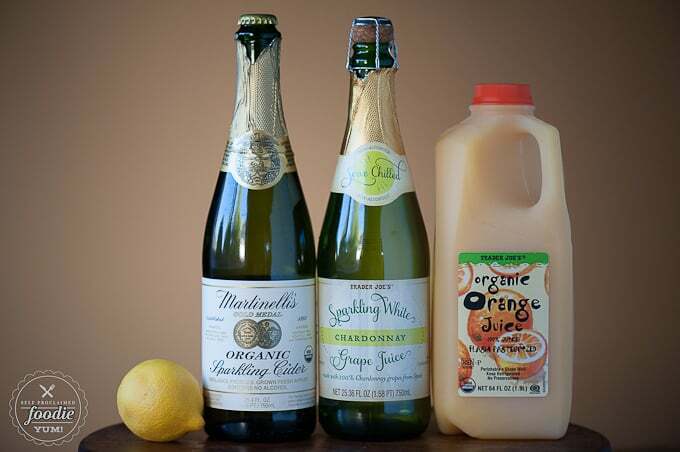 Just replace the sparkling grape juice with sparkling white wine, or dare I say vodka or rum. 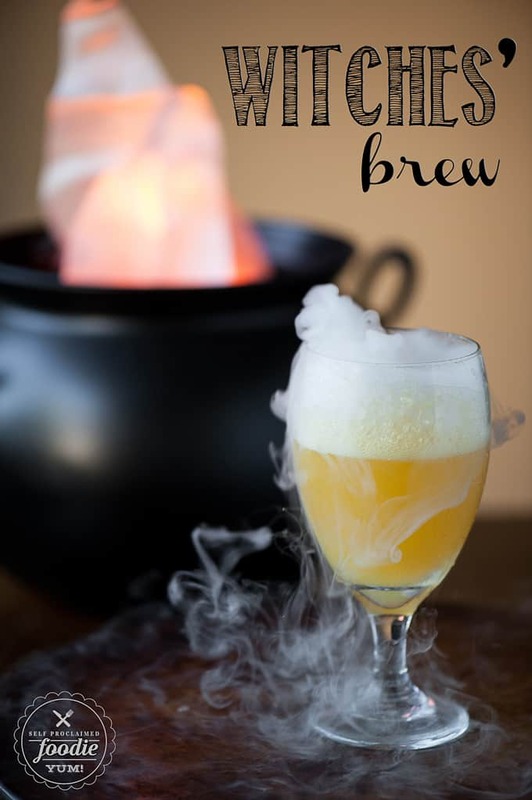 Any way you make it, everyone will be mesmerized by the spooky smoke coming from your brew. 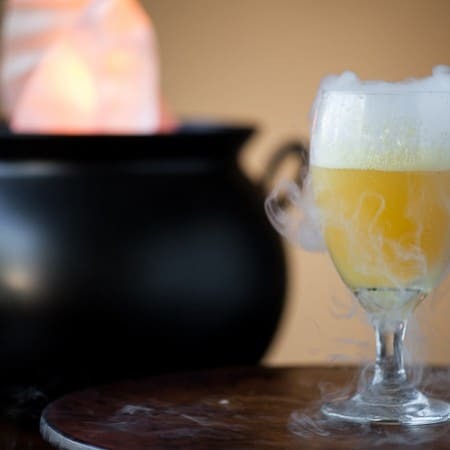 This sweet and sparkling Witches' Brew made with fruit juice is a fun Halloween party drink for all ages and can easily be made into an adult cocktail too. This drink is very sweet (pure juice) and can easily be diluted with club soda. This Witches Brew looks BREW-timous!!! What a fun and creative grown up drink for Halloween! Pinning! Oh that looks so cool! I never knew where to get dry ice either, but we have a Baskin Robbins close by – I’ll pop by and check! Beautiful drink! Love your photos! I thought dry ice if poisonous? Dry ice is solid carbon dioxide which is what we exhale. I never have used dry ice before. My question is it safe in a punch bowl for a kids party, and what I mean is it safe to mix in with the punch? If so, just make sure no dry ice from the punch bowl gets into their cup, right? Can you send me a reply by email, thanks! This is so cool. I made the mistake of thinking from the photos that it would be alcoholic, but why shouldn’t the kiddies have a fun drink too. The preschool sounds like a great one. This is such a fun party punch! So spooky cool! My son was just asking if I could make a special drink for them on Halloween. I think I just found it – this looks delicious and so fun! What a fun idea and great being family friendly too. This is so cute! My daughter will love this so much. Always fun to have a kid-friendly cocktail! What a fun and versatile idea! And your photos are just crazy good!